People make wills at all stages of life, and sometimes they forget to update the wills to account for changes in their lives. For example, a person who makes a will and then later gets married may not remember to go back and change the will to account for the new spouse or any children they have together. When this person passes away, the old will that was not updated is still valid, but the law makes some changes to account for the new spouse. The surviving spouse from the example above is legally referred to as a pretermitted spouse, and receives a share of the deceased’s spouse estate that is equal to the share the surviving spouse would have received if the deceased spouse had died without a will. In Florida, this share could be half the estate or the whole estate, depending on whether or not both spouses had children with other people. There are exceptions to this law. The point of providing for pretermitted spouses is because the law assumes that the deceased spouse would have wanted to provide for his spouse, but simply forgot to change the will. However, when the deceased spouse’s intent to not provide for the spouse is clear, the law follows that intent in not giving the spouse a share of the estate. 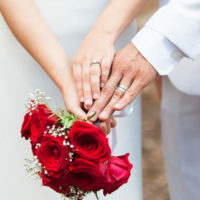 Therefore, if the couple signed a prenuptial or postnuptial agreement in which they relinquish claims on each other’s estates, the law will give effect to the agreement and not give the surviving spouse a share of the estate. This is also true if the surviving spouse is otherwise provided for in the will, or the will states a clear intention not to make any provision for the surviving spouse. It is important to note that Florida also has laws nullifying bequests to spouses who are later divorced. In divorce cases where a person dies before changing the will to remove the divorced spouse, the law automatically removes the divorced spouse from the will. The will in this case is read as though the divorced spouse died at the time of the divorce, and therefore cannot receive any assets under the will. However, if the deceased specifically intends to leave something to his ex-spouse, he can make an express bequest in the will and be clear that it is left to ex-spouse despite his or her status as an ex-spouse. In order to avoid having the courts make important changes to your will that alter your larger estate plan, it is important to update the will often. This is especially so if you have major life changes that could affect your will. When you get married or divorced, have a child or grandchild, or acquire new assets, it is important to meet with your attorney and discuss how to update your will, trust, and other estate planning instruments. If you are thinking of writing your will, you should consult with an experienced estate planning attorney to ensure that you satisfy the requirements to have a legally valid will, and that your testamentary intent is clearly conveyed. Call an experienced estate planning attorney from the Millhorn Elder Law Planning Group located in The Villages, Florida.